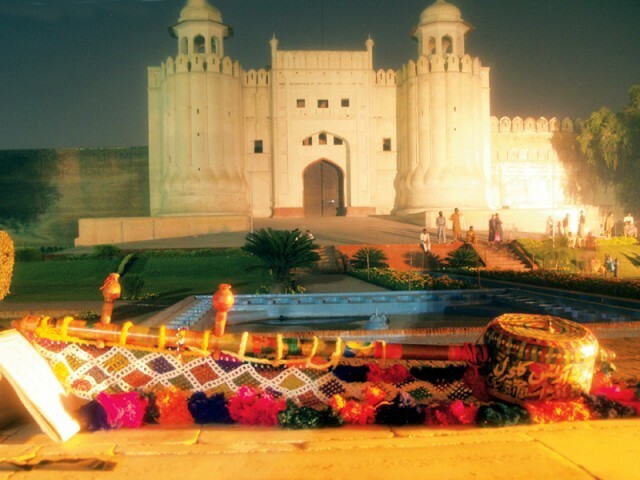 Decorated with colourful streamers and encompassing a unique sense of history, the concert and poetry recital ‘Sangeet Akath’ held at Hazoori Bagh on November 14, was a journey into Lahore’s old city culture. The evening witnessed folk singers and poets giving tribute to Waris Shah’s love story “Heer Ranjha” and exploring Sufi poetry. Organised by the Trust for History, Art and Architecture of Pakistan (THAAP) with the patronage of Lok Rahs, a not-for-profit, volunteer based theatre and arts organisation, the event tried to transcend the class boundaries by going door-to-door to invite local residents. The audience comprised of a diverse array of people, as aside from the ‘well-to-do’ crowd, the gathering included Sikh pilgrims and residents from the area as well. Many of the folk performers at the event also had unique story; for instance Malik Shaukat Ali, a rickshaw driver by profession, rendered witty Punjabi poetry and pointed out the importance of promoting it. Despite not being able read, Ali has done a lot to promote Punjabi folk tales and has frequently bought Punjabi story books with his salary and distributed them amongst people. Other performers such as Sain Mushtaq and Sain Ajaz from Sheikhupura and Arif Sulehri from Narowal gave impressive vocal performances. A 25-member Punjabi dhol performance saw energetic street drummers entertaining the audience. At the end of the night, the audience went away knowing that indigenous folk music still has a profound impact on local mainstream culture. The historical context of Hazoori Bagh also provides an insight to the area. This garden was built by Maharajah Ranjit Singh, the first emperor of the Sikh empire, in 1813 to celebrate his capture of the famous Koh-i-Noor Diamond from Shah Shujah of Afghanistan. The Hazoori Bagh is bounded by the Lahore Fort (East), Badshahi Mosque (West) and the mausoleum of Maharaja Ranjit Singh (North). Used as a katcheri, where petty disputes were discussed during the British Raj, it later became a public space used for the community’s local recitals and entertainment. Sher Khan, The Express Tribune, LAHORE: November 17th, 2011.